Ok dudes, I know no one is sitting around in this beautiful weather reading design blogs (otherwise I would have had, like, a zillion comments on my hilarious post on wood last week). (whatever). Since my keen design vision and insightful comedy stylings are not to be lost on blind interwebs, I'm taking this opportunity to see if there really is anyone out there. In each of these pictures lies a hidden clue. Look closely. I will supply hints along the way. Let's see if anyone can find the golden trinket in each photo. 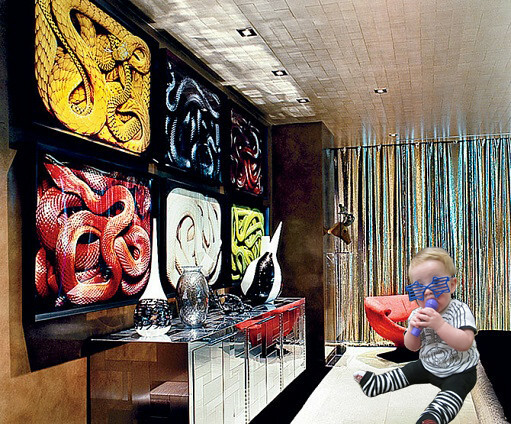 Hidden among this otherwise unnoteworthy photo of Sir Elton John's bedroom is the most amazing image you will ever see. Keep looking. It's there. I promise. 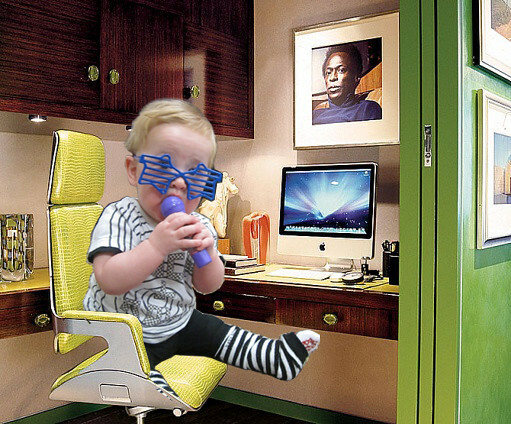 A good night's rest and fresh eyes should help you to locate the secret image among this kinda lame office in Sir Elton's apartment. Hint: the thing that you are looking for does not have electric boots or a mohair suit, but it may or may not be chewing on a microphone. You can do it! I believe in you! Ok, do not be distracted by the amazing snake photographs / mirrored console / silver curtains in the only room that is appropriately decorated for the rocket man himself. I photoshopped in something special just for you here. Can you see it? Ok, that was hard. do you give up? Discreetly hidden in each photo was the world's most precious baby (under 18 months division) as seen at his very first 80s dance party. No, Lady Gaga is not his godmother, but his real mommy is pretty awesome and doesn't think much of Elton John's apartment. Can you guess who the baby is? ps you can see the complete snooze fest of a tour here. pps martyn lawrence-bullard designed it.